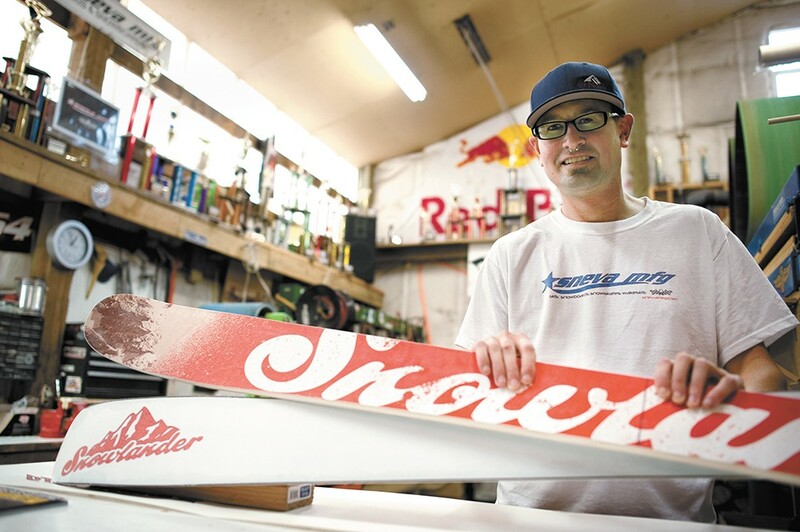 T.J. Sneva's company builds around 1,000 pairs of skis and snow skates a year. Many people are familiar with the name — as a ski manufacturer, race car driver, born and raised Spokane local. The man behind the name is T.J. Sneva. Born in Spokane 41 years ago, he started skiing at age 3 at 49 Degrees North with his family, and it was over from there. As Sneva explains, "I went with my uncle and cousin and immediately fell in love with skiing." Over the years, he skied mainly at 49 but did venture over to Schweitzer on occasion. After graduation from high school, he describes, "I didn't have a college plan and there was year-round skiing at Mt. Hood so I moved there." Over the course of his tenure in Oregon, he groomed at Ski Bowl, one of the several resorts located under Oregon's iconic volcano. It was during his time in western Oregon that the idea of making skis would start to come to fruition. It was all based on the twin-tip technology that snowboarders were enjoying. Sneva had heard a rumor that a snowboard manufacturer was going to implement this same concept but in skis. That is what he was anxiously hoping for, anyway. After waiting, he finally called the company he had heard the rumor about and they denied it. It was then that he started working on making skis. Fast forward to where he and his grandfather built their own ski press, the first pair of Sneva skis were born and the original twin-tip ski was introduced to the world. "We found the solution to the problem," Sneva says. The problem being the transition from flat-tailed skis to a twin-tip ski. That was in 1994 and has been going ever since. There was a small hiatus from the forward momentum of being a full-time ski manufacturer when he moved to Indiana to follow in his family's path of race car driving. While he still skied in the winter and made skis out of Speedway, Indiana, his focus shifted seasonally — building skis in the winter and spending all his time on the track in the summer. He grew up around racing cars so this was a logical step in his life's journey. His younger years were spent travelling to races in his family's motorhome. "My entire family raced cars," he says. "My grandfather, his five boys including my dad, and my Uncle Tom won Indy in 1983." His stint in the Midwest lasted about five years and upon his return to the Inland Northwest, he threw himself back into his manufacturing business and all the great reasons why we live in the Northwest. His favorite aspects of the Inland Northwest? "Mountains, skiing," he says. "We are spoiled. We have five mountains within an hour." He adds, "I have skied so many places. And every time I go somewhere, I think about how spoiled we are back at home." In addition to keeping crazy busy with this manufacturing business which now includes skis and snow skates, Sneva has recently gotten back into race car driving. He can often be found at the Stateline racetrack as well as travelling throughout the Northwest and Canada in the skiing off-season. Over the years, he has raced all sorts of cars and as Sneva reports, "I'd drive anything they would let me get behind." It was the year when he moved back to Spokane that he met his now-wife, Lauren, coincidentally at the Two Seven Public House on the 27th of the month. They have a 3-year old daughter aptly named Winter who recently bagged the accomplishment of skiing from the top to bottom at 49 Degrees North following in her dad's footsteps of a passionate skier. The original print version of this article was headlined "The Man Behind the Name"